IQinVision, one of the market leaders in high-performance HD megapixel IP cameras recently announced that it would be releasing its all new IQeye R5 Series of bullet cameras. 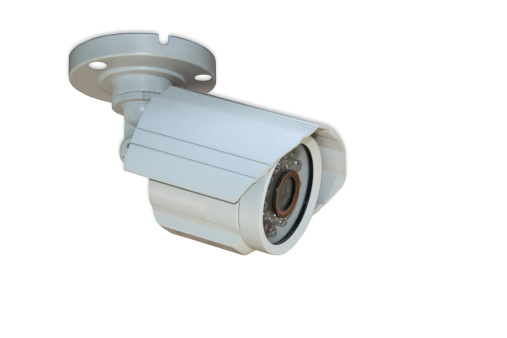 The R5 Series bullet cameras are full-featured, multi-megapixel H.264 Main Profile indoor/outdoor bullet cameras. In addition to that, these cameras also have support for up to 3MP resolution, making these cameras versatile and able to provide multiple, individually-configured H.264 and MJPEG streams simultaneously. These cameras also feature on-board storage as well as a built-in IR, making them perfect for retail, commercial, city and transportation applications. Other features that are included with the IQeye R5 Series are 30fps at HD720p and HD1080p, 20fps at 3MP and an IP66-rated outdoor housing. There are also a host of applications that are available for the R5 Series. Some of these applications include IQfinder, IQmanager, IQevent, IQanalytics and Direct-to-Storage while the camera line is backed by the IQVision best-in-industry warranty of three years. Bullet cameras have been the go-to system for lots of different applications. Businesses, schools, parking lots and other scenarios use bullet cameras due to their small size and ability to be installed virtually anywhere. In addition to that, most bullet cameras are weatherproof, meaning they are the perfect solution for outdoor surveillance as they can stand up in rain, snow, wind, dust or any other condition you throw at them. Bullet cameras are also exceptionally good at night surveillance. Built-in IR LEDs are common in almost all bullet cameras, allowing you to record 24/7 day and night. In addition to that, some of these cameras have the ability to see as far as 300 feet in total darkness or farther depending on the amount of LEDs built-in. Vandal-proof housing is also generally included in all bullet cameras as well. Not only are bullet cameras small enough to put out of reach but also, should someone try to tamper with them, the vandal-proof housing will stop them in their tracks. With the ability to be put virtually anywhere, the small size, the day/night surveillance capabilities, the weatherproof housing and the ability to connect to apps and stream each camera individually it’s easy to see how bullet cameras, like the R5 Series, are one of the most popular products in modern surveillance. There’s always a reason as to why we do the things we do. There’s always a purpose behind the choices we make. A method to our madness if you will. I’m not trying to come off as overly philosophical, more so just trying to make a point. When we choose a particular piece of technology over another, there’s always a reason for it. We’re not going to purposefully choose the worse device over the better one. At that point, you would be wasting your money and coming off as illogical. You can apply this to just about every device. Take a security camera system for example. You can have all the necessary recording software you need, but when it comes to the actual cameras, there is always comparisons to be had and decisions to be made. All in all, there are plenty of choices that can be made that will meet your surveillance needs. There is one camera in particular, though, that many use; the bullet camera. Again, there’s a reason for this. There is a lot that a bullet camera can offer the smart surveillance system shopper. The bullet camera is a generally small camera that can be placed in various discreet locations, usually far enough out of reach to avoid vandalism. The entire reason you’re looking for a surveillance system is to stop things like vandalism anyway, right? These cameras are designed with a streamlined structure that allows them to be set up in places that most cameras couldn’t be placed in. Naturally, because of the design, this is where the camera gets its name. 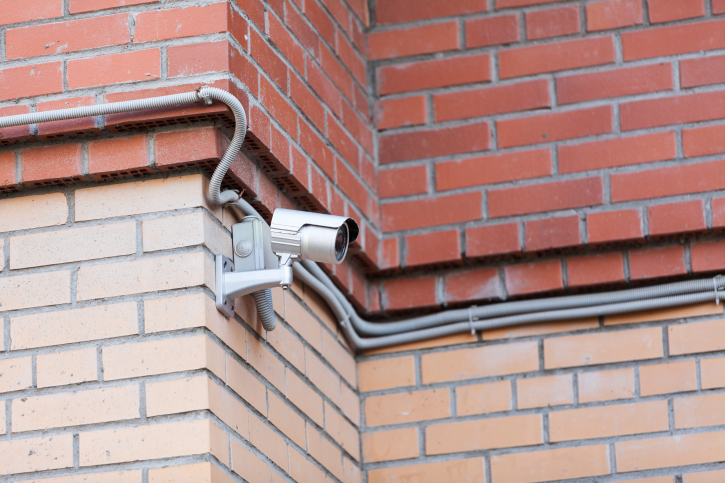 When you set up your security camera system, you want to be able to do it with the confidence that your cameras won’t be susceptible to vandalism. When you choose to have a bullet camera as part of you’re system, you get that confidence as they are easy to hide. These cameras are also weather-proof. These are essentially the best cameras to have for outdoor surveillance. The typical box camera requires additional housing to the camera itself, and that can add to the overall cost of your security system. Additionally, bullet cameras are relatively cheap. Once placed outside, nothing short of a hurricane or tornado is going to stop this camera from monitoring what ever you want it to monitor. If you’re looking for night time monitoring (who isn’t), you don’t need to worry about looking for another type of camera either. Most, if not all bullet cameras these days come with built in IR LEDs. Some of these IR bullet cameras can see up to 300 feet in complete darkness thanks to the number of Infrared LEDS that are packed into them. That’s the other sense of brilliance in the camera’s design. The lenses of these cameras are generally small, so that leaves more room to put the infrared LEDS in them. Obviously the more you have working together, the further the camera is able to see in the darkness. The bullet camera is one of the most utilized cameras in any surveillance system, and with good reason. Between the weatherproof housing, the small size that can be utilized for proper and secluded placement, and the fact that almost all of them come with IR capabilities now, it’d be almost asinine to NOT have these in your security camera system. Looking For A Weatherproof Bullet Camera? If you live in the northern part of the U.S., you may have become very aware of all of the snow that we have been getting recently. This ridiculous weather can cause quite a bit of trouble for travel conditions, as the news has shown. However, it can also become a burden on some of your technology. Satellites, internet connections, and more can be negatively affected by this inclement weather. For some homes and businesses, dealing with crazy weather like this can be slightly nerve-wracking when thinking of their security camera systems. Not all tech is weatherproof, and that is a fact. However, there may be a new bullet camera for those who want to avoid worrying about the weather year round. Take the new Greyfox F2287 weatherproof camera for a spin, and you may be able to put the worries of warranty coverage away. 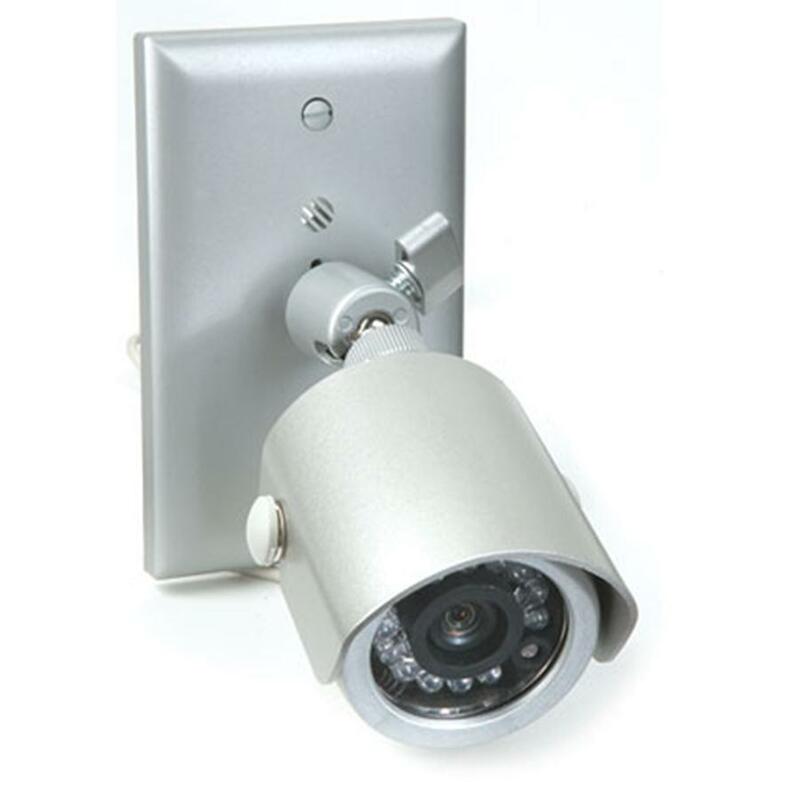 This camera is designed for indoor and outdoor use for, virtually, any home or business. Even though it is mainly suited for residential security use, it is never a bad idea to add one to your business’s security system. Since the housing of the camera is weatherproof, it can be installed outside by doorways or windows that need to be monitored all without the worry. In terms of mounts, this camera can me mounted via a round wall mount or a Cat 5 camera mounting wall plate. The Cat 5 wall plate is designed for the camera itself, and includes RJ-45 output and input jacks that can be installed into a single gang box. Naturally, the mounts come with adjustable tilt and swivels so that the camera can be aimed in any direction needed. Once the desired angle has been met, the angle can be locked so that it remains. The camera also comes standard with IR (as if every camera shouldn’t, right?). 12 infrared LEDs surround the camera lens, allowing for illumination in low-light to no-light situations. Perfect for night time surveillance in the areas you need to have covered at home, or at your business. The IR illumination expands to a 30 foot range. While it may not be the longest range of IR, it still allows for enough viewing to spot anything that may be suspicious. The F2287 camera resolution rate comes in at 420 lines, so while it may not be the highest resolution, it can still definitely get the job done. The 92 degree viewing angle, coupled with the angle locking mounts, means that you should be able to get a very good view of whatever you need to keep track of. The camera does offer a microphone attachment. The only catch is that it must be hooked into a single gang wall mount. The microphone can then be plugged in, and mounted via the same wall mount as the camera. Just make sure you know about the restrictions of audio surveillance before installing the camera, with the microphone option, in your business, should you choose to do so. It may not be the most incredible bullet camera out on the market, but the weatherproof casing does give it reason to be considered for your security system. And, as always, if you are on the fence about it, it never hurts to try before you buy! Why Get A Bullet Camera? When showing interest in home or business surveillance, it’s very easy to get to get side tracked or confused by the plethora camera types on the market. It it always best to do your research and then make your purchase. However, you can never really go wrong with bullet cameras, as long as you know how to mount and operate them. If you aren’t exactly sure why they would be a good choice, just think about all of applications that you could use them for. Once you have figured out what you need them for, then you can make the choice. Just remember when deciding, the bullet camera is very versatile. Remember the reason for the name of bullet cameras. They are small. Roughly around 2 to 2.5 inches in length. This also helps attribute to their other name; lipstick cameras. The versatility of these cameras is definitely a huge help when setting them up. While most cameras such as box or dome cameras require separate housing for the camera when placing it outdoors, the bullet camera doesn’t. They are quite easy to install and can be placed virtually anywhere due to their small size. Theirr mounts usually always come with an extension arm. This arm helps in putting the camera in the exact position that you want it to be in. It doesn’t even matter if you wish to mount them on the wall or the ceiling. 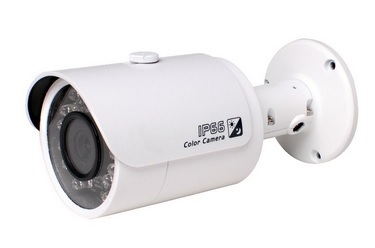 Like most cameras, it can be purchased with IR capabilities as well. 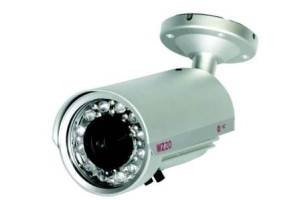 Since the bullet camera has the shape it does, it is also very well suited to host quite a lot of LED InfraRed lights. Some can even hold up to 78 LED IR lights with a range of about 300 ft in the dark. With all of the positives, the bullet camera is not without its own flaws. Due to the extension arm, it can become quite susceptible to vandalism since they can be repositioned so easily. They are usually very limited to a pretty fixed focal length from the lens. The small shape and design can also interfere with the overall imaging of the camera due to the cut-off corners. Because of this, the camera’s field of vision can become negatively affected. This can cause a cut-off view of what you are trying to capture on your surveillance feed. The only way to try and avoid this is by proper positioning, different types of cameras to accompany your bullet camera, or seeing if there may be a different lens that can be fitted for your bullet camera. When looking at it on paper, this camera could be perfect. Well, as long as it’s in a safe position away from vandals that is. Since most are IR equipped, they are perfect for night time surveillance. Their small size means that they can be very easy to tuck away into tight spots. They also produce the same type of digital video quality as most box and dome cameras. It has no need for the additional housing as a box camera would and has a longer range for InfraRed viewing than most dome cameras because of its shape. All perfect reasons to start out your security camera system with this versatile camera.